Apartment is composed of a lobby, one bigger (sleeping) and one smaller (dinning/living) room. 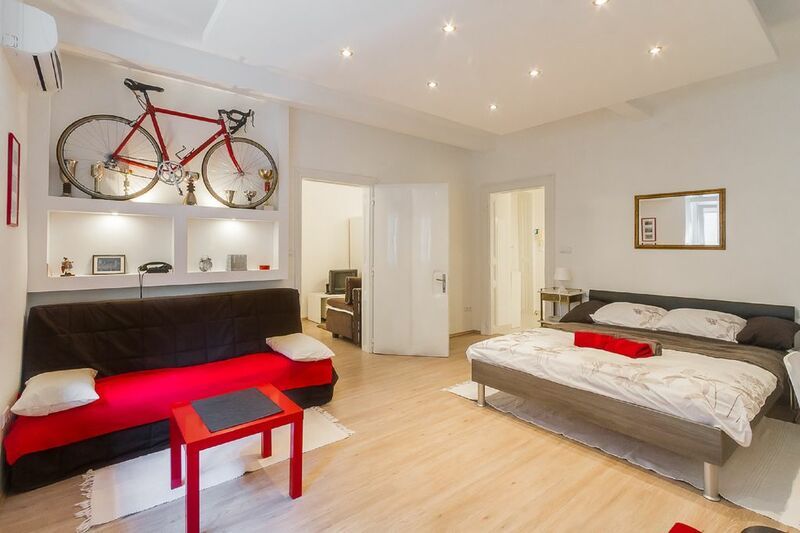 Big lobby (10 m2) is perfect for all your luggage quiet internet area or even bicycles. Spacious double bedroom (20 m2) is for 2x2 person with one double fixed bed (160X200) and one extra bed together with wardrobe and TV. Cycling memorabilia, pictures and an old racing bike are property of the owner who was engaged in competitive cycling for many years. Smaller room (14 m2) consists of eating area and living area with couch (150X190), wardrobe and TV. Shower and toilet are separated and very elegant, all in white and grey colours. Kitchen is small but fully equiped and well organized. All furniture is functional, modern and new, with some old pieces of furniture, pictures and bycicle racing posters as a decoration spice. My wife Ana and me are 49 and 50 years old living in Zagreb, Croatia. We have two son`s of 11 and 8 y old. We love spending time with our childern and our friends. Most of all we love cycling, listening good music and spending time in nature. I am a great cook and my wife is commited to reading. We are in this business because we love meeting new people and new cultures. I´m working full time as a private apartment renter and as cycling coach and my wife is an independent HR and education consultant. We live and work near apartment. I was born and lived in this apartment since 1967 untill 2002. I´ve got married and move to live in another place with my family, renoved and completally refurnished the place and make it suitable for rennting. Since it is a quiet, pleasant place for stay with perfect location, we knew that this is a good decision. We are in this bussines for almost 4 years now collected wonderful guest rewiews. Perfect location, peaceful, pleasant and clean space. I´m trying to be helpful to all my guests provide them usefull informations concerning their stay in Zagreb. Building system heating, heatres in each room. Kitchen is small but fully equiped and well organized. Two bicycles in a hall for free use. The apartment is located in the very heart of the historical center of Zagreb only 50 meters from our main square: square Bana J. Jelačića and just 100 meters distance from our best green market with delicious croatian domestic products. At least 20 museums and numerous galleries are in 1-15 minutes walking distance from our apartment. This part of the city also contains many famous interiors, architectural attractions and public monuments (almost all are situated in center). There are also many interesting restoraunts and clubs and famous and attractive Zagreb coffe shops. Multiplex cinema is at 10 minutes walking distance. During your stay in our apartment you will easily get excellent impression about our cultural and night life and be a part of a Zagreb spirit! At your demand, we will gladly provide you with first hand advices and tips about your field of interest.